After writing about the British supergroup Electronic recently (Bernard Sumner and Johnny Marr with the Pet Shop Boys), here's an American supergroup of a much quieter nature, but no less powerful. 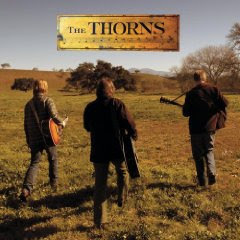 The Thorns were completely molded in the spirit of Crosby, Still & Nash, three brilliant individual talents with the emphasis on three-part harmonies on all the vocals and lots of acoustic instruments that combined together truly worked. However, unlike CSN, where the members were on their way "up," the Thorns were three guys who'd pretty much been around for substantial, even long, amounts of time, had one Top 40 hit between them (not that that matters), and somehow found the time to do an album that was anything but surefire. The Thorns consisted of power pop maestro Matthew Sweet, gritty singer/songwriter Shawn Mullins ("Lullaby"), and Pete Droge, whom I had never heard of. But anything Sweet is involved with gets my attention. They were joined by Atlanta-based producer Brendan O'Brien, who produced a couple of early Sweet albums and recently did the last two Bruce Springsteen records. O'Brien seems to have taken an active role in the proceedings, producing a pristine throwback acoustic rock and folk record where you never hear any one singer solo, but always all three at the same time. In an unlikely move, the major label Columbia Records picked it up for distribution. "Runaway Feeling," the album's lead track, is all bouncing major key guitars and mandolins, a perfect upbeat summer pop track. In 2003, nothing like this would have a snowball's chance in hell of being a hit, but who cares? This is just a great song, almost from another more progressive era, done in a style that you'd need to dig up on an indie label if you knew about it. Somehow, I hope these three find the time to record another treat of an album. Since this album's release, I saw Shawn Mullins perform at the Pleasantville Music Festival in summer 2007. If all you knew him by was that one-off megahit "Lullaby," like I did, you've got to try and catch him perform live. He's a husky fellow who writes some really powerful songs and does it all solo. Below is the band performing "Runaway Feeling" live on the German TV show Rockpalast.